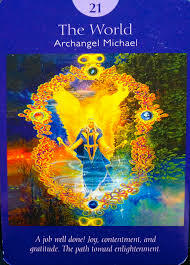 Card of the Day ~The World~ The angels sent you this card because you’ve happily completed something of great importance. They’re congratulating you on a job well done. You’re now ready to move on to something new. Enjoy your feelings of wholeness and completion, and give yourself a pat on the back for your amazing accomplishments! You’ve grown spiritually and have evolved to a whole new level in your understanding of the Universe. You’ve experienced significant enlightenment and have expanded your consciousness of how to attain joy and contentment. You feel a great sense of gratitude. Take a deep breath before stepping forward towards your next journey. Have a magnificent day! I love you all!